Trucking companies are exposed to numerous fleet tax challenges if they chose to operate outside of their home jurisdiction. Among the most imposing tax challenge is the International Fuel Tax Agreement (IFTA) program that requires fleets to record and report all the distance accrued and fuel purchased in each member jurisdiction. The number of fleets utilizing paper trip reporting has been drastically reduced with the common usage of GPS fleet tracking and Electronic Logging Devices (ELD's) that include distance reporting. Regardless of how fleet distance and fuel is tracked, it is your responsibility to ensure that the data included on each and every quarter on your IFTA return is accurate and can withstand the scrutiny of auditors. Your fleet's profitability can depend on it. Why would you want to outsource your fleets IFTA fuel tax reporting to TransReport Services? Why wouldn't you! Does your fleet have GPS tracking or ELD's installed in your vehicles? TransReport can download data directly from your GPS or ELD system and complete verifications to ensure all distance is properly allocated (for audit protection). IFTA records are managed and maintained in industry leading fuel tax software ensuring you never pay more than you should. For those companies that utilize individual vehicle distance records (IVDR's) or electronic means (excel spreadsheets, google sheets, etc) to keep track of vehicle distances and fuel, we have a plan for you too. Wondering how IFTA fuel tax fits into your fleets overall compliance? Here's what we've found in 25 years of business. The International Fuel Tax Agreement, or IFTA, is a cooperative agreement among the 10 Canadian provinces and 48 American states. 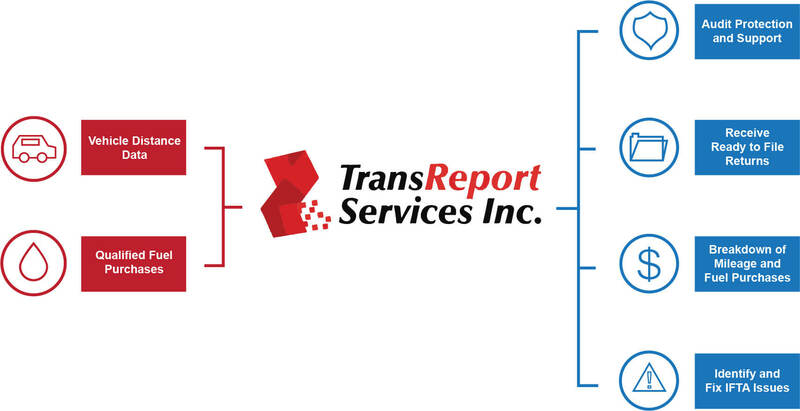 TransReport Services provides customized IFTA fuel tax reporting services to trucking companies in both Canada and the U.S. Heavy Vehicle Use Tax Filing Season is Here! IRS Heavy Highway Vehicle Use Tax (HVUT) is required if you operate a vehicle in the US weighing over 55,000 lbs. Did you know you can claim credits? Read more about Heavy Vehicle Use Tax Filing Season is Here!